Always arriving exhausted at the villa and with a family stay to organise I am always to pleased to meet the smiling butler who can make sure I, the hostess, has a stressfree and relaxing stay. I have enjoyed the service of the Heritage butlers during both of my stays and admire their enthusiasm and hard work. Their presence is a major part of the villa holiday and they represent to me the genuine Mauritius hospitality – always friendly but not over familiar, willing to adapt to any situation and the natural desire to be of help and to please their guests. WHEN YOU ARRIVE, THE BUTLER WILL …. UPON DEPARTURE, THE BUTLER WILL …. One of the best experiences for everyone at Heritage was the In-Villa Dining BBQ. Chefs and waiters come to your villa and prepare the food. Whilst you start your dinner you can see the chef barbequing the meat infront of you; the smells are just as much part of the taste of the meal. First crudités and salad with freshly prepared dressings decorated the table. First coming of the main course the beef steaks which melted in your mouth like butter. Then, accompanied by a special Barbeque sauce, came the Lamb Shanks which were equally tender and delicious. After this was the culinary pinacle and final main dish, the giant Indian Ocean Prawns were fluffy and generously flavoursome. The dessert was a beautiful trio of Chocolate Mousse with Citrus Curd, Tiramisu and Tropical Fruit Kebab. Once we had had our coffees to finish, we met the chefs and applauded them enthusiastically as we had a fantastic meal. I am definitely a morning person who really appreciates a thoughtful and exciting breakfast menu which was what we were treated to in Chateau de Bel Ombre whilst staying at Heritage Villas. One either sits inside the chateau itself or on its exquisite terrace looking over the fountains and golf course. The tables were beautifully laid with lovely white porcelaine. We were seated on the terrace and began our breakfast taking in the vista. All started well with coffee for me and a pot of hot chocolate for Jasmine. I am however always disappointed when breakfast is served in the wrong order; such as when the yogurt or cereal arrive after the cooked breakfast or the pastry basket is taken away when the cooked breakfast arrives! Everyone enjoys this meal in their own way and I wished the staff would have simply asked, if that is not the case if you are staying I would urge you to make it clear in which order you would like it in before it begins. Otherwise our experience at Chateau Bel Ombre was excellent. I chose the Mama Creole omelette and savored the spicy delights of Mauritius a highlight of my day and Jasmine chose her favorite eggs, hash brown and bacon. Positioned on a sandbed and surrounded by filaos trees, the villa of 300 M2 Faces north west has contemporary style by using natural materials like stone, white or weathered board, raw concrete, inOx, raw materials, linen and relaxed furniture. The island surrounded is by sea and the front of the house has a small staircase leading to it’s own natural swimming pool between l’Ilot and a couple of neighbouring islets. Guests can enjoy the local treasures of the sea; such as crabs, crayfish, sea bream, local sacrechien and capitaine fish, which are brought by the local fisherman Ali. The low tides are spectacular exposing vast sandbanks. 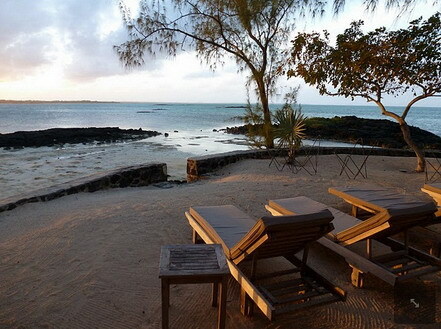 The property allows the visitor to be near Mauritius but offers a peaceful retreat. It is for rental for max 6 adults and 2 children – 4 Bedrooms (2 with en suite bathroom/wc and a Family Suite of 1 room with double bed). Special memorable moments are enjoyed at this unique villa. Villas Lencia’s concept is the ultra designer home from home. It’s made up of 4 beautiful villas – Villa #1 being beachfront with a pool and 4 suites and then there are 3 guest villas with 3 suites each as well as their own pool. The property is the home of an international businessman and art collector where this villa is an expression of his love of Mauritian culture and his taste for art and design. In a nutshell they are 4 stunning villas with hotel service, concierge, gym and spa right on a private beach. Villa #1 is a stunning home in a 1600m2 garden and with a living space of 490m2. Just a few of our favourite features of the property are the 300m2 terrace with two huge Fabio November masks at each end of the heated 75m2 pool as well as the linear frames that house the day beds. Then there is the stunning living area of 120m2 with an open plan kitchen. Additionally the suites with a patio of 60-70m2 are beautiful, as well as the lobby with its library area, the master bedroom with its huge dressing room and bathroom with designer tub. There is also a fully equipped gym and private massage salon. The interior design includes Henri Pedersen Imola chairs, carpets from Toulemonde Bochat, JLB Litezone and Blacheree Illumination for the lights and Elitis for the walls. The villa also houses a private collection of photographic works by Jean-Daniel Lorieux and Slim Aarons (american photographer of the stars in 70s) and works by artist Pierre Letellier and of other artists; some up and coming such as Christiaan Conradie, Daniel Orme, Paul Senyol, Rezo, Kilmani-Jo, Bagus Rai, Costache, and Allan Tuttle. Villas 2, 3 and 4 are guest villas of 3 bedrooms en suite in a 600m2 garden and living area of 285m2 with a 85m2 living room and open plan kitchen. The ground floor master suite is 45m2 with a pool patio. The villa terrace is 100m2 with a heated swimming pool of 50m2 and a gazebo of 6m2. Rental is with breakfast, fully staffed with butler, cook and security 24/7. I am blown away by the freshness and originality of these new villas. 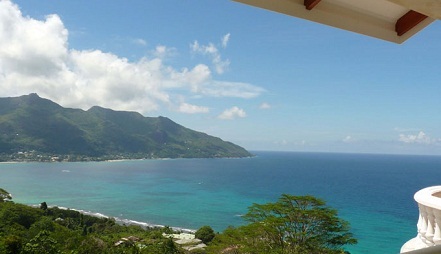 It raises the bar in Mauritius luxury villa rentals. The owner has put his heart into every detail of design and delights us with his personal collections.